On a recent sunny weekend day, I found myself long on time and short on money. The kids wanted to get out of the house so, based on a friend’s recent suggestion, we piled into the family vehicle and took off in search of outdoor public art in Hendricks County. As it turns out, the number of outdoor public art displays in our county surprised me! Here are ten locations in Hendricks County where we found public art -- all of it free of charge and publicly accessible. We started our quest for art on the historic Hendricks County Courthouse Square in Danville. On the northwest corner of the Courthouse Square, across the street from the Mayberry Cafe, you&apos;ll find a Bicentennial Bison -- part of the statewide "bison-tennial" art project celebrating Indiana&apos;s 200th anniversary of statehood in 2016. The artwork on Hendricks County&apos;s bison was completed by local artist Kerry Trout, and the statue was unveiled during a public celebration last fall. From the bison, you&apos;ll easily be able to see the giant "Open Windows" mural painted on the side of Diesel&apos;s Sports Grille a half-block down Main Street. This beautiful piece of art captures many of Hendricks County&apos;s iconic people and places, and it was painted in 2016 by Danville&apos;s own, Tiffany Black. 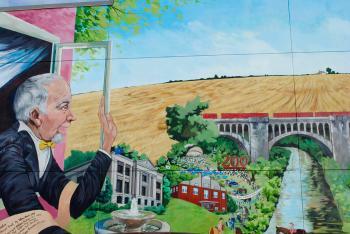 A few blocks down Main Street from the "Open Windows" mural, you&apos;ll find Danville Town Hall (49 N. Wayne St., Danville). Sitting in front of Town Hall are two sculptures that were donated to the town by the Indianapolis Museum of Art. The larger of the two sculptures is called "Holistic Image VIII" and was created by Betty Gold in 1980. The 16-foot-tall work of art arrived in Danville in 2010 after several decades on display at the Museum of Art. The smaller of the two sculptures is called "Nimrod" and was created by Oded Halahmy. "Nimrod" was on display in front of the U.S. Federal Building in lower Manhattan in 1975 for our nation&apos;s bicentennial celebration before making its way to the Indianapolis Museum of Art and then to Danville. Near the Northwest Entrance at Hendricks Regional Health (1000 E. Main St. in Danville) is a little hill that leads down to some cafeteria windows. On that hill, for those eating in the hospital&apos;s cafeteria to enjoy, is a sculpture by Gary Lee Price called "Children of Peace." 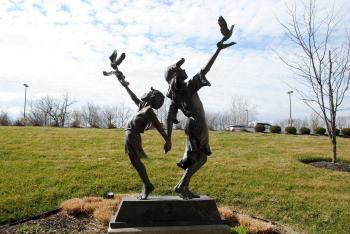 The artwork depicts a boy and girl releasing doves into the wild. Almost directly across the street from Hendricks Regional Health, located at 1285 E. Main St. in Danville, is Vicary Auction Company. Their building sports a neat mural that was painted by Julie Vornholt in 2016. I particularly enjoy the depiction of the 1933 Ford that the band ZZ Top used on the cover of its "Eliminator" album -- one of my favorites as a kid. 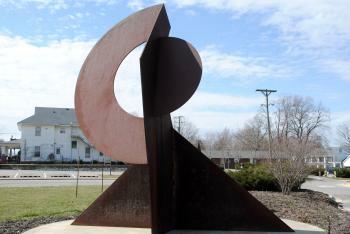 You&apos;ll find two pieces of outdoor public art at Avon Town Hall Park, located at 6570 E. U.S. 36 in Avon. 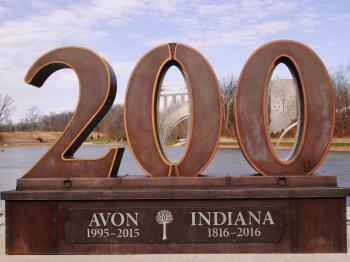 The first is right behind Town Hall and is another celebration of the Indiana Bicentennial -- the "200" sculpture by Randall Flake that simultaneously commemorates 200 years of statehood and 20 years of Avon&apos;s existence as a town. This sculpture, in place since 2016, is a very popular visitor destination and photo backdrop. From the "200" sculpture, turn left and walk down the paved trail a few hundred yards to discover the Angel of Hope statue, erected in 2008. Based on the original statue created by Ortho and Jared Fairbanks, Hendricks County&apos;s Angel of Hope depicts a child with arms outstretched toward heaven. The Angel of Hope at Avon Town Hall Park overlooks an area where parents whose children have lost their lives can come to grieve and reflect. 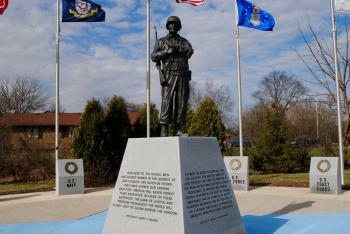 The WWII Memorial Park in Avon sits on the northwest corner of the intersection of Dan Jones Road and County Road 100 South. A roundabout controls that intersection, but Pine Tree Elementary School sits right next to the park at 7866 E. County Road 100 South, and you can park in their parking lot and easily walk to the memorial park without having to navigate traffic as a pedestrian. Within this very nice memorial park is a statue of Brigadier General Clyde C. "Chet" Wright, an Avon resident with a decorated career in the U.S. Army during World War II. General Wright himself placed a wreath at the base of the statue in his likeness at the park&apos;s dedication in 2013. The statue was created by Bill Wolfe. At 2601 Stout Heritage Parkway, just to the southeast of The Shops at Perry Crossing in Plainfield, you&apos;ll notice a giant bony fish leaping from a pond. 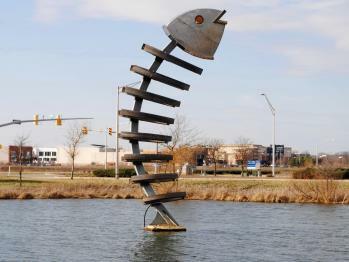 The sculpture, aptly called "Fish," was designed by Indianapolis artist Matthew Berg, Jr. and erected in 2003. Just up the street from "Fish" is the Samaritan Companies at 170 N. Perry Road in Plainfield, which boasts a neat mural on its building. The mural was painted by James Quebbeman of the Urban Artist Network. From Plainfield, we drove straight up Ronald Reagan Parkway, through Avon, to County Road 300 North in Brownsburg to find the tunnel along the B&O Trail that safely leads walkers, runners, bicyclists and other trail enthusiasts underneath the parkway. 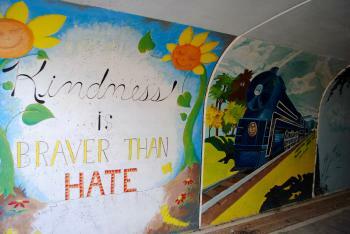 The B&O Trail Tunnel is beautifully painted by several different artists on both sides, all the way through. Most of the artwork is dated in 2012. The tunnel does not have any artificial lighting, but in the daylight, the tunnel is short enough to be well-lit all the way through, allowing for easy appreciation of the artwork. Our final stop on our excursion took us to John Force Racing at 498 Southpoint Circle in Brownsburg, right along Northfield Drive. Near the corner of Southpoint and Northfield is a statue of the late Eric Medlen, a mechanic and Funny Car driver for John Force Racing who was killed in a racing accident during a test session in Florida in 2007. The statue was fabricated by Storyland Studios in California and unveiled at a ceremony at John Force Racing in 2007 -- just months after his death. The statue depicts Medlen celebrating a victory at a 2006 race in California. Sculptures, Statues and Murals - Oh My! The next time you find yourself in search of a free family-friendly activity, visit Hendricks County and check out these outdoor works of public art. I seriously doubt that I found all of the artwork in Hendricks County, so comment below and tell me what I missed!